As you read before I had an awesome playlist to help me shuffle along through my 14k this weekend and I wanted to share my running jams with you!! So there you have it- my 21 song playlist. It came out to be around 1 hour and 30 minutes long. 1. Make your playlst for a specific order and place your ultimate running songs in strategic places- when you go to actaully play your list DO NOT HIT SHUFFLE! 2.If you are aiming for a specific finish time make your playlist for that amount of time- for me that is encouragement to get my race done! Who wants to run without music? NOT ME! 3.Make sure you know what your LAST song is on your playlist. For me if I hear that song that means I need to get moving- especially if I hear that song and the finish line is in sight! What are your newest additions to your playlist? 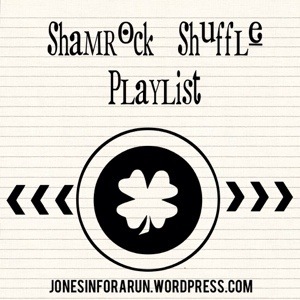 Previous Post Shamrock Shuffle Race Recap!